F Alessio Bertaggia (Brandon, Spokane, 2011-13) was traded with Calle Andersson by Zug to Lugano (both Switzerland, NL A) for Dominik Schlumpf and Sandro Zangger. This season, with Zug, Bertaggia had one assist in 18 games. He grew up in Lugano and played his minor hockey there. It being almost that time of the year, I spent a few hours wandering the hallways of the Orchard Park Mall in Kelowna on Wednesday afternoon. Yes, Christmas carols were in the air, Remembrance Day having been over for — what? — 12 hours or so. You may find it hard to believe, but not once did I hear Connor McDavid’s name spoken, not even under someone’s breath. Mind you, I didn’t stroll into Jersey City. The OHL’s Erie Otters revealed Wednesday that McDavid has a broken bone in his right hand that could keep him out of action for six weeks, give or take a few days. That would seem to indicate that he won’t be available for the Canadian junior team’s selection camp that will precede the 2015 World Junior Championship that is scheduled to open on Dec. 26 in Toronto and Montreal. Still, unless McDavid is a slow healer, you can bet Hockey Canada will keep a roster spot open for him. McDavid, of course, was injured on Tuesday night when he inadvertently punched the boards or glass during a fight, the first of his OHL career that involved actual fisticuffs. He is a scorer, not a fighter and now has proved it. It should come as no surprise that the debate — to fight, or not to fight — has raged on since word of McDavid’s decision to fight lit up the world of social media. But, really, there is no debate. To fight or not to fight is no longer the question. Fighting is on the way out of the game hockey; there can be no doubting that. 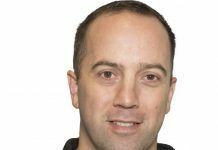 The fourth-line enforcer has all but disappeared from the NHL and is a thing of the past in major junior hockey. I can’t think of coach at the junior level and above who, given his druthers, doesn’t want to play a four-line game. And there isn’t a coach out there who wants his best player to be fighting for fear of the same thing happening that happened to McDavid. An injury like that to such a player could be the difference between making the playoffs and going golfing for some teams. It could be the difference between coaching and having to find a real job for some men. If McDavid isn’t able to play for Canada in the WJC, the impact of his hand meeting the wall could be incalculable. 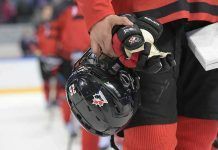 After all, as Button points out, Team Canada may be without Aaron Ekblad, Sam Bennett, Jonathan Drouin, Anthony Duclair, Bo Horvat, Curtis Lazar and Nate McKinnon, all of whom are eligible but with NHL teams. Add McDavid to that list and the news could be devastating for Team Canada. However, there still is time for McDavid to recover and, with all the various forms of therapy available, you have to think the chances are good that he’ll be there for the opening faceoff come Boxing Day. You can bet that McDavid’s absence will be noted tonight when Sportsnet televises Game 3 of the Super Series, this one from Peterborough, Ont. It was be noted again Friday when Sportsnet shows a game that features the McDavid-less Otters agains the Niagara IceDogs. Meanwhile, the fighting debate will rage on. Unfortunately, many of those who take part in that debate are missing the point. The disappearance of fighting from hockey hasn’t anything to do with an anti-fighting stance taken by writers who never played the game. Rather, it is disappearing because neurologists and others who are researching brain injuries have discovered the painful toll that athletes (and others) who have suffered such injuries can end up paying, some of them immediately and others later in life. It is disappearing because lawyers are filing lawsuits and more are surely to come. I dare you to read Tough Guy, the biography of the late Bob Probert, or Boy on Ice: The Life and Death of Derek Boogaard, by John Branch of The New York Times, and then make the argument that there is room in the game for fighting. Without fighting, the onus will be on the leagues and their referees to make sure that the rules are enforced, especially when it comes to the superstar players. You don’t see the best players in the NBA getting mugged on a nightly basis, if for no other reason than it realizes which players are its meal tickets. BTW, the Toronto Maple Leafs have had two fights this season. Two! D Evan Wardley of the Seattle Thunderbirds now has been suspended six times for a total of 21 games over the past two-plus seasons. . . . His latest suspension was handed down Wednesday, this one for five games after he took a checking-from-behind major and game misconduct during a game against the host Saskatoon Blades on Saturday. . . . On that night, he was playing in his fourth game since serving a seven-game suspension for a headshot major and game misconduct in an Oct. 11 game in Portland. . . . Last season, he drew a four-game sentence for a charging major against Portland on Nov. 1 and a two-game suspension for a boarding major against Kamloops on Dec. 31. . . . In 2012-13, he sat out one game after picking up his third game misconduct on Jan. 5 against Spokane and two games after collecting his fourth game misconduct of the season against Everett on March 9. Having played two games for Team WHL against a Russian side in the Subway Super Series, F Greg Chase has returned home to await a trade. The Calgary Hitmen are working to do just that. Whether that happens, or when it happens, apparently won’t have anything to do with Chase’s Team Canada fortunes. 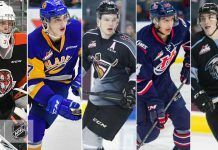 “We had Greg at our summer camp and I’ve got a real good feeling for Greg watching him play a lot with the Hitmen,” Hockey Canada head scout Ryan Jankowski old Daniel Nugent-Bowman of the Saskatoon StarPhoenix. “I’m comfortable knowing what I know right now.” . . . Chase was a healthy scratch from a game in Saskatoon on Nov. 3. He left the Hitmen and now is awaiting a trade. . . . He didn’t hurt his cause with two solid performances with team WHL. . . .
G Bolton Pouliot, 20, who has had stints with the Kamloops Blazers and Portland Winterhawks already this season, now is with the AJHL’s Calgary Canucks. Pouliot, who is from Calgary, was released by the Winterhawks last week. . . .
Steve Ewen of the Vancouver Province hits the nail squarely on its head right here, as he writes that young hockey players, like G Eric Comrie of the Tri-City Americans, are being asked to play far too much hockey. In Prince Albert, the Regina Pats erased a 1-0 deficit with eight straight goals, six of them in the second period, as they beat the Raiders, 8-3. . . . F Pavel Padakin led the Pats with two goals, giving him five, and two assists. . . . Pats F Austin Wagner added his fifth goal and two assists. . . . Regina G Daniel Wapple stopped 41 shots. . . . Regina F Morgan Klimchuk scored his fifth goal to give his side a 2-1 lead at 15:49 of the first period. The goal came while the Pats were shorthanded; it was the only special teams goal in the game. . . . The Raiders have lost three in a row. . . . In Moose Jaw, G Justin Paulic turned aside 31 shots to lead the Warriors to a 6-2 victory over the Seattle Thunderbirds. . . . With G Zach Sawchenko out with an undisclosd injury, Paulic was backed up by Brody Wilms, an eighth-round pick in the 2013 WHL bantam draft. 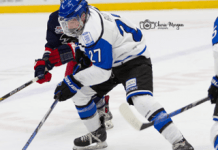 Wilms, from Coquitlam, B.C., plays at the Okanagan Hockey Academy in Penticton, B.C. . . . Paulic, 19, went 12-29-8 last season with Moose Jaw, but Sawchenko grabbed the starting job this season. As a result, Paulic won his first game of the season last night and now is 1-4-1. . . . After Seattle scored the game’s first goal, the Warriors took control with four goals in a row. . . . D Tyler Brown was back in Moose Jaw’s lineup after sitting out with an undisclosed injury. . . . The Thunderbirds were without F Mathew Barzal, who has been on crutches due to an undisclosed injury. I didn’t see the game on Shaw-TV last night, but there were reports that the telecast crew reporting Barzal could be out for two months. . . . Matthew Gourlie of the Moose Jaw Times-Herald has a game story right here. In Vancouver, F Carter Popoff scored twice in 36 seconds and the Giants went on to a 6-2 victory over the Tri-City Americans. . . . Popoff’s goals, at 15:04 and 15:40 of the second period, gave the Giants a 3-0 lead. He’s got 10 goals. . . . Vancouver F Johnny Wesley, added to the lineup from the BCHL’s Surrey Eagles, scored 10 seconds into the first period. . . . Interestingly, each of Vancouver’s goals included just one assist. . . . Among Tri-City’s scratches was F Richard Nejezchelb. . . . Vancouver G Cody Porter stopped 19 shots, 18 fewer than Tri-City’s Evan Sarthou. I fought two times last week and nobody said anything.